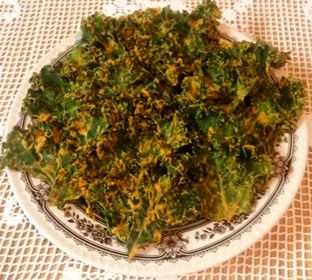 250 -300 g Kale leaves without stems , torn into bite-size pieces. Granulate the Cashews first in a food processor, add the water and continue blending the cashews. Blend the rest of the ingredients, except for the Kale, in a high speed blender until smooth. In a separate large bowl drench your Kale in the “cheese” sauce and mix well so all leaves are equally covered. Spread the Kale evenly on baking trays lined with baking paper and dehydrate at 50 deg. C in a fan forced oven for about 8 hours, or until complete dry and crunchy. Turn chips around about half way through to make sure they get evenly dehydrated. This quantity fills 5 large baking trays. In a small oven dry chips in 2 lots, while the remaining Kale keeps well in a covered container in the fridge.